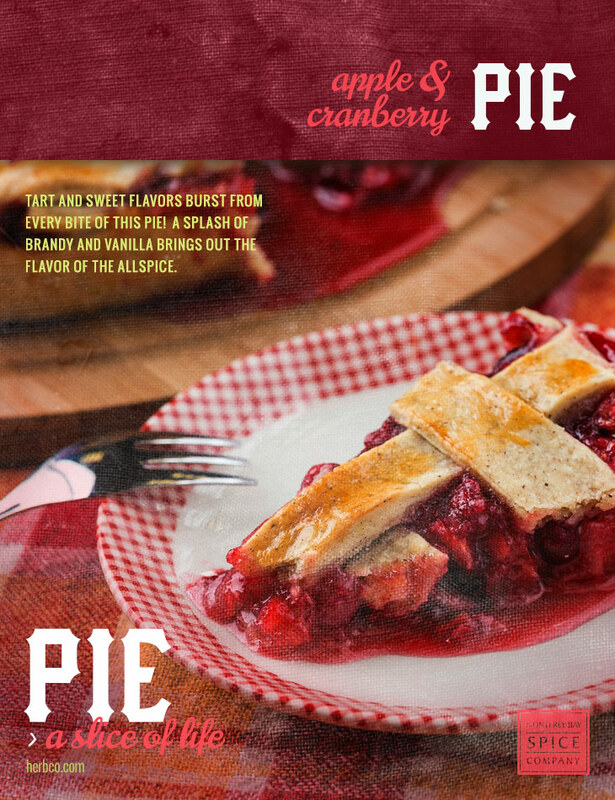 Tart and sweet flavors burst from every bite of this pie! A splash of brandy and vanilla brings out the flavor of the allspice. This recipe calls for Granny Smith apples. You can, however, use an assortment of good baking apples, like Golden Delicious and Pippin. Preheat the oven to 375° F.
In a large bowl, toss together the apple slices, sugar, flour and allspice until the applies are well coated. Fold in the cranberries. Gently stir in brandy and vanilla. Transfer filling into a prepared pie crust. Top with second crust; seal and flute edges. Mix egg yolk with a teaspoon of water; brush over edges and top of crust. Bake at 375’F for 30 minutes, then reduce to 350’F and bake another 45-55 minutes. Cool on wire rack for at least an hour before serving. in the archived edition of our Oct 2016 email.